The handbrake or parking brake as it is also referred to should be used at only certain occasions whilst learning to drive and during a driving test. This is obviously dangerous and easily fail a driving test, so try to be relaxed about the use of the handbrake. Detailed below is when the handbrake should be used during a driving test. A driving test will involve the examiner asking you to park up on the left on more than one occasion. When you have stopped the car, apply the handbrake and select neutral. Throughout a driving test there will be many occasions that the car will need to be stopped. For example this could be waiting behind other vehicles in traffic or stopping at a red light. The examiner will expect you to use the handbrake when stopping in such situations but try not desperately grab the handbrake the very moment you have stopped. When you have come to a stop, wait 5 seconds or so and if it looks like you will remain stationary for a while, apply the handbrake. By doing this it will eliminate the possibility of you applying the handbrake too early whilst you are still moving, plus you may move off again quickly and so there was no need to use the handbrake anyway. There is no rule for using the handbrake during manoeuvres, so this really depends on the situation. Roads often slope towards the pavement (camber) and if demonstrating a manoeuvre, it may prove beneficial to apply the handbrake to avoid rolling into the kerb. These cambers can be steep and the use of the handbrake and the clutch biting point may help to prevent you rolling forwards or backwards and hitting the kerb. Similarly for the other manoeuvres, if you think using the handbrake will provide you with greater control, then use the handbrake. If your driving test is in an area where slopes and hills are present, it’s likely you will be making hill starts on your driving test. Hill starts demonstrate to the examiner that you have good and safe control of the car and that you will not allow the car to roll backwards when moving off. Use of the handbrake and the clutch biting point will eliminate and rolling. If the junction is on a slope and there’s a risk that the car may roll either forwards or backwards, it would be advisable to secure the car using the handbrake. If she has very good clutch control and there’s no risk of the car rolling, then it is acceptable to wait using clutch control only. However, bear in mind that sitting stationary on the clutch bite point does increase wear on the clutch, so the preferred method is to wait either by using the the foot brake to secure the car (on a flat surface) or the handbrake (if on a slope) – but not engage the clutch until you intend on moving off. This does require greater clutch control though as the possibility of stalling is increased. Essentially, choose which method she is most comfortable with as it will not impact the test result providing she has good control of the car. Perhaps just bear in mind the cost of replacing the clutch in the future. It depends on the situation and the vehicle. If you’re stopped in traffic (not moving) for some time, put the transmission in neutral or park and apply the handbrake. If the car has electronic parking brake, then there’s less chance of rolling, such as pulling out of a junction with an incline for example, so you will need to use the parking brake less. For manually operated parking brakes, you’ll need to use these more often regardless of whether it’s a manual or automatic vehicle due to there being more chance of rolling. My pupil sometimes finds it impossible to release the handbrake for a hill start unless she uses both hands. As long as the car is not moving and she holds it on the bite until hands are back on the steering wheel, is this acceptable or a fault? There’s definitely potential for a fault there if the car did move whilst she still had both hands on the handbrake. Does the handbrake need to be applied so hard that it requires both hands to release it? Is she pulling it up too much or does it need adjustment? There’s no specific rules for this, it’s about the road you’re on and the amount of time. The road you’re on – if you have stopped on a slope, it’s often a good idea to apply the handbrake to prevent rolling. Time wise – if you arrive at a red light and it has been red for a while and you expect it to change very soon, there’s no need for the handbrake. If it has only just changed to red, then apply the handbrake and leave the car in 1st gear. If you’re in a queue of traffic and are stationary for a longer period of time, apply the handbrake and select neutral. 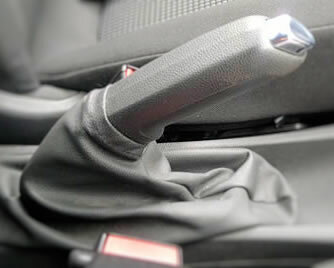 Use of the handbrake in an automatic is essentially the same as though it was manual as described in the comments. Hi, my instructor has never told me to apply the handbrake when stopped at traffic lights or in traffic. I just keep the clutch down, should I start or is it ok that I don’t? Would I be faulted for it on the test? Stopping and using the handbrake in traffic / traffic lights is more of a safety measure rather than a test requirement. No need to use it if you are moving at short intervals, but if it looks like you’re going to be stationary for a bit, then put the handbrake on. Say when you stop, if no one is still moving after 30 seconds or so, secure the car with the handbrake. You wont fail if you don’t, but if your foot were to slip off the clutch or brake and the car moved, it might result in a fail. If the handbrake is applied, your car would not do this. Thank you for your reply! Ok I’ll start trying to use it when I see the traffic light has just turned red. What about zebra crossings, if someone is crossing would you recommend using the handbrake? Any situation where you might be stationary for a while really, just to secure the car. It’s totally your discretion if and when to use it. Equally though, don’t overuse it by applying it too much such as each and every time you stop. In normal conditions should the handbrake be pulled up as far as it can go? Also if I’m leaving my car for a while or in cold weather is pulling it up not fully, ie just enough to secure the car going to help stop it seizing? You should avoid pulling up the handbrake excessively as you may risk stretching the cables which connect the system. Pulling the handbrake just until you feel it becomes tense should be sufficient for all occasions and weather. You can leave the car in gear for added security if you wish. Do you always need to use the handbrake when you stop at a stop junction? In terms of the driving test, it generally depends on how long you’re waiting. If you’re stationary for a while, it’s best to secure the car. Also if you’re on a slope where you may roll backwards, it’s a good idea to use the handbrake to prevent you rolling backwards. Though there’s no official rule that you have to use it at all at junction. It also depends on what technology you may have in your vehicle, hold assist, hill start assist etc..